There is a load of work involved… can YOU help? 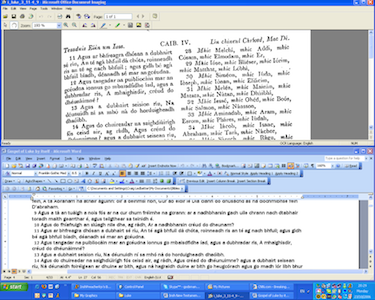 There are only three tools needed to help us transcribe/digitize the Irish language Bible texts: 1) A Computer, 2) Microsoft Word, and 3) Adobe Reader to view PDF files. 1. Open one of the several PDF copies of the scanned Irish Bible, and position it in the upper half of your Computer Screen. You may need to switch between different copies when the scanned page you are working from is not clear enough to read. 2. Open the Book to work on in Microsoft Word – you will have to create it and name it if it does not exist yet. Place its window towards the bottom half of your Screen. 3. All documents need to be kept together in the same directory. 4. Remember to purposely Save the Book periodically with a CMD-S or Ctrl-S.
5. Type the text as written, including any accents. Make Sure you include the text exactly as it appears, including the fact that a letter is CAPITALIZED, and that the beginning of a verse has a number. Page numbers however, do not need to be included. 6. Concerning the use of fada’s in MS-Word: A vowel with a fada accent mark is produced simply by pressing the ‘Alt Gr’ key (to the right of the Space Bar) and while still holding it down, then pressing on the needed vowel. 7. Inserting a Paragraph Mark (pilcrow symbol ¶) involves clicking on Insert and then click Symbol or Advance Symbol, and then find the Paragraph Mark and double click it to insert it in the text. 9. Make sure the Irish Chapter Summary is set to Centered. 10. When all editing is finished, email the final Microsoft Word document to biblebc@gmail.com for review. 12. Go to the next book, and repeat.